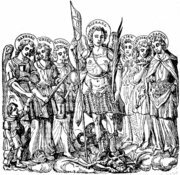 Today is the Feast day of Michael and all Angels. This is the first since my younger brother, Michael as joined that vast throng in heaven, and is especially important to me. The Bible tells us that God's creation is vast and richer than we can know in our simple minds. There are beings that worship God in heaven, and are some sort of messengers between Heaven and Earth, they also seem to act as His agents here in this world. We don't know a lot about them but Michael is mentioned as the leader of the Heavenly armies against the dragon. Michael (the name means, "Who is like God?") is mentioned in the Scriptures in Daniel 10:13,31; 12:1, Jude 9, and Revelation 12:7. We usually see him depicted in full armor, carrying a lance, and with his foot on the neck of a dragon. Gabriel (the name means "God is my champion") is mentioned in Daniel 8:16; 9:21and in Luke, he is the Angel of the Annunciation. 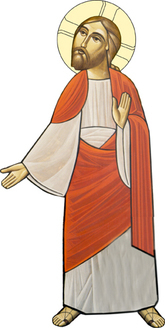 He has been viewed as the bearer of special messengers between God and man. Raphael (the name means "God heals") is mentioned in the book of Tobit, where he appears as a man to Tobias. Uriel (the name means "God is my light") is mentioned in 4 Esdras. 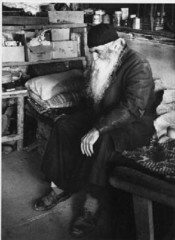 There is an old story of a man coming to a Monastery and demanding that the Abbot show God to him. The Abbot said, "You want to see God?, come on I will show him to you." Off they went, around and down to the back of the Monastery. There in a small cell was a dirty, old Monk. Kinda smelly, not very attractive in any sense. The Abbot points to him and says: "There is God." The man was incredulous and snorted: "That's not God, that is an old broken down man!" The Abbot replied: "My son, unless you see Christ in this man, you can't see Him at all"
Jesus said to them, "Who do you say that I am?" "You are the eschatological manifestation of the ground of our being, the kerygma of which we find the ultimate meaning in our interpersonal relationships." I want to start this post out by saying that I love this country. America has for so many years shown the way to the rest of the world, innovating in ways that for us modern people hard to even notice, much less grasp the importance of. However, my first duty is to God, and I have noticed lately that something needs to be mentioned in our own house. In politics these days Christians are on the ascendant. They control most of the Republican party, which directly controls the entire Congress, the Presidency, and most Federal Judges are Republicans or appointed by Republican Presidents. One could say that more than almost anytime in it's history, America is a Christian nation. Torture is an unmitigated moral evil. I have no understanding of any sort of truly Christian theology in which torture is not a grave moral sin. So here we are in what can arguably be considered the most "Christian" of political times and for the last five years we have been torturing various suspects around the world. Where is the outrage? I would think that Dobson, Falwell et. al. would be among the first to stand against this horrible practice. What happened when Gays started getting married in one state? 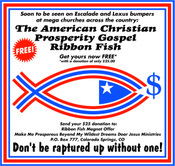 There was a huge response, sermon after sermon, direct mail fundraisers, email alerts, pressuring politicians to create a constitutional amendment. 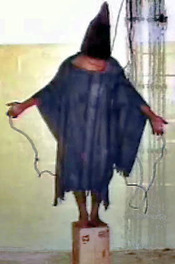 The President authorizing torture in the name of America? The silence is deafening on the Christian Right. What does that tell us? Somehow something has changed in American Christianity. 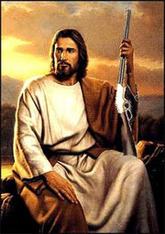 We no longer believe in the gentle Shepherd from Nazareth, we have put our faith in politics, guns and bombs. We have lost our way on a sea of scarlet sin, and have no one to blame but ourselves. God, the Father of all, Whose Son commanded us to love our enemies: Lead them and us from prejudice to truth; deliver them and us from hatred, cruelty, and revenge; and in Your good time enable us all to stand reconciled before You; through Jesus Christ our Lord. Amen. What are we to believe about the nature of the resurrection? God has often come to us as empty space, remember the Ark of the Covenant? God was there, enthroned between the Cherubim, marked by an empty space. The space between the Angels proclaimed the very Presence of God. Always invisible, a God, who cannot be represented, who cannot be possessed and contained. 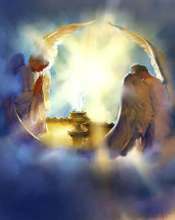 God said in Exodus 25:22 that He would speak to us, commune with us from that empty space, the space between the Angels. Just as the presence of God is marked by the space between the cherubim, so when we come to the tomb, we can comprehend the presence of the risen Jesus by the empty space between the two angels at each end of the slab. For me, this emptiness becomes evidence of the Divinity of Jesus Christ, of God communicating to us. And so while trying to be Christ's body in this world we must always to submit to the objective reality of the risen Christ who is communicating to us from that empty space in the tomb. 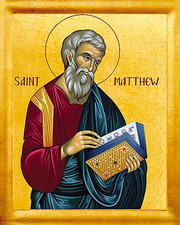 Today is the day the Church remembers Matthew, who was both an Apostle and an Evangelist. In Jesus' day no one was more despised by the Jews than publicans (or tax collectors). They combined the natural distaste for those who collect taxes (who loves the IRS?) with being agents of the hated Roman oppressors. The people had a double hatred for them. Funny thing is, apparently Jesus broke right through that cultural mindset and invited Matthew to follow Him. How easy it is to overlook that. After that, Matthew brought many of his associates to meet Jesus, and social outcasts all over were shown that the love of Jesus extended to them. Hm. Socially despised by "God fearing" people. Interesting viewpoint Jesus has - not sure His Church shares it, but hey we have ten acre Campuses and Family Life Centers to pay for. Anyway isn't it amazing how Jesus invites people? He asks, He doesn't manipulate, scare, or tempt with financial gain. He invites. Who do we invite to the Kingdom? Would you speak to one such as Matthew? I had a good night of fellowship with some friends last night. Teachers at an Evangelical high school and some other friends. One of the topics was the disconnect between the Jesus of the Gospels and the Jesus of American Christianity, so I felt it was a good time to post my derivation (with author's permission) of Prof. Mark McEntire's article on the American Beatitudes. Do you recognize the gospel our politicized Church preaches? Would Jesus? Can you name the REAL ones? --Blessed are the rich, for theirs is the Kingdom of heaven. Why not, they own everything else? --Blessed are the arrogant, for they will inherit the earth, and pay no inheritance tax on it. --Blessed are those who have declared themselves full of righteousness, for they need nothing from anybody. --Blessed are the merciless, for they need no mercy. --Blessed are the war-makers, for they shall be called patriots and Children of the Almighty. --Blessed are those who persecute others who are not as righteous as them, for theirs is the kingdom of heaven. --Blessed are you when you revile and persecute and utter judgment against the lowly and despised of this world, for they are the cause of all our problems. It made me consider something. Who is this Jesus? I know what I believe about Him, but more importantly how do I act about what I believe. In other words perhaps I need to show my faith in Christ by my works as well as my belief. I was wondering something this morning. When did Greed get baptized? This whole prosperity "gospel" thing going around sure seems to feed into our basest emotions. I have heard Preachers raging against the Lottery, Liquor by the drink, gay marriage, abortions, and whoever the current xenophobic focus is as "They*" are "taking over". When was the last time you heard a sermon on Greed? Perhaps since that is one of the foundational principles of Capitalism and everyone knows that the American Way is best, then Greed is good now. Well I have heard that, but just cant square it with the REAL Gospel I see Jesus living. I think he wants us to live it too, but how will the W stickered, SUV driving, teeth whitened suburban Church ever know? I don't know that their Preachers will ever tell them, lets hope they actually read the Gospels they have laying there on their home theater system. *Communists, gays, femiNazis, Muslim terrorists, Godless liberals, Mexicans are just a few. Two young men discussing a potential call to monastic life.